John Hughes’ movies were a cultural touchstone for an entire generation of young people in the 1980s. With Sixteen Candles (1984), Pretty in Pink (1986), and Ferris Bueller’s Day Off (1986), he had an uncanny ability to tap into how teenagers felt about things and related to each other that was entertaining and poignant. 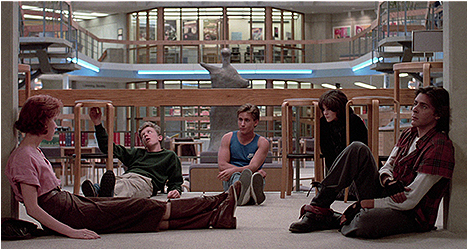 Of all his teen movies, The Breakfast Club (1985) has endured the longest and is considered to be one of his signature movies as well as emblematic of the ‘80s. The movie’s premise is deceptively simple: five teenagers are forced to spend a Saturday in detention together. They each come from a distinctive clique in school: there’s Andy Clark (Estevez), the jock; John Bender (Nelson), the rebel; Claire Standish (Ringwald), the popular one; Brian Johnson (Hall), the brainy nerd, and Allison Reynolds (Sheedy), the weirdo oddball. They’re supervised by Assistant Principal Vernon (Gleason) who in advertently succeeds in bonding this misfit group over their shared loathing of him and, in the process, find ways to relate to one another. At the time of its release, a big deal was made about how The Breakfast Club showed how teens really talked to each other and the R-rating allowed a character like Bender to really cut loose as the group’s snarky antagonist. Judd Nelson clearly relishes the role, talking back to Vernon, bullying Brian, hitting on Claire, and provoking Andy. He gets most of the movie’s memorable dialogue and delivers a ferocious performance. Nelson also has fantastic chemistry with Molly Ringwald, who plays a materialistic preppie drawn to this obnoxious rebel. She clearly gets off on the attention as she doesn’t get any at home, confessing that she is used as a pawn between her warring parents. Their ability to get under each other’s collective skins is the movie’s strongest scenes. As the day continues, these kids are left alone with each other, they get past their facades and begin to get to know each other, learning something about what it is like to be in their respective shoes. Over the course of The Breakfast Club, Hughes gradually delves beyond the stereotypes of the characters and, in the process, humanizes them. It helps greatly that his talented young cast do an excellent job of bringing these characters to life. The end result was a movie that connected profoundly with its intended audience and continues to do so with future generations to this day. This new 4K transfer looks stunning. It really highlights the use of color and shows off the detail of the image. Hughes’ movie has never looked better. A carryover from a previous edition is an audio commentary with actors Anthony Michael Hall and Judd Nelson. Naturally, they talk about their respective characters and what Hughes was like to work with – his approach and methods, etc. The track starts off strong but tends to peter out towards the end. There are 51 minutes of deleted and extended scenes that give us more little moments between characters that, while interesting, were rightly cut to keep the movie focused and under two hours. Also included is a 2008 retrospective documentary featuring interviews with cast and crew who talk about what it was like to work with Hughes. They talk about his ear for dialogue and his knack for picking the right song for the right moment. Some of the movie’s more famous fans – Diablo Cody – talk about the profound effect it had on them. There are excerpts from a 1985 American Film Institute seminar with Hughes that goes back to his life before filmmaking and how it informed his work. He talks about various aspects of The Breakfast Club, like casting, in this very informative extra. There is a collection of vintage interviews for an electronic press kit that was done for the movie with soundbite interviews with Hughes and the cast that include Sheedy (who is refreshing unguarded and unrehearsed), Nelson (who speaks quite eloquently), and also veteran character actor Gleason who talks about his acting process with behind the scenes footage. There is a new interview with Ringwald and Ally Sheedy done exclusively for Criterion. They both talk about how they got their respective roles. They also offer their initial impressions of him and his working methods. Also included is a 1999 radio interview with Hughes. He talks about how important music is to him and how that translated in his movies. There is an audio interview with Ringwald from a 2014 episode of This American Life. She talks about watching the movie with her daughter for the first time. “Describe the Ruckus” features Nelson reading from Hughes’ production notes with footage from his movie in this video essay. His notes shed invaluable light on the filmmaker’s creative process. There is a segment from a 1985 episode of NBC’s Today show with Ringwald and Nelson talking about their characters and the movie.